Ready for a gin and tonic revolution? Well. Maybe revolution is a bit overboard. But it’s time for a movement of some kind to elevate the glories of the beloved G & T. A campaign maybe? Sure would beat the other brand of campaign we’re being pounded with these days. This would be a happy and uplifting campaign. No caucuses and delegate-counting, no juvenile jousting and mind-numbing politicking. Just gin…..and tonic. And a few of their cool friends. I will always be a fan of old-school and have no aspersions to cast on a timeless Bombay & Schweppes version of this iconic cocktail. Tall glass, lots of ice, wedge of lime: perfect refreshment. But it’s been great to see some interesting variations on the theme. 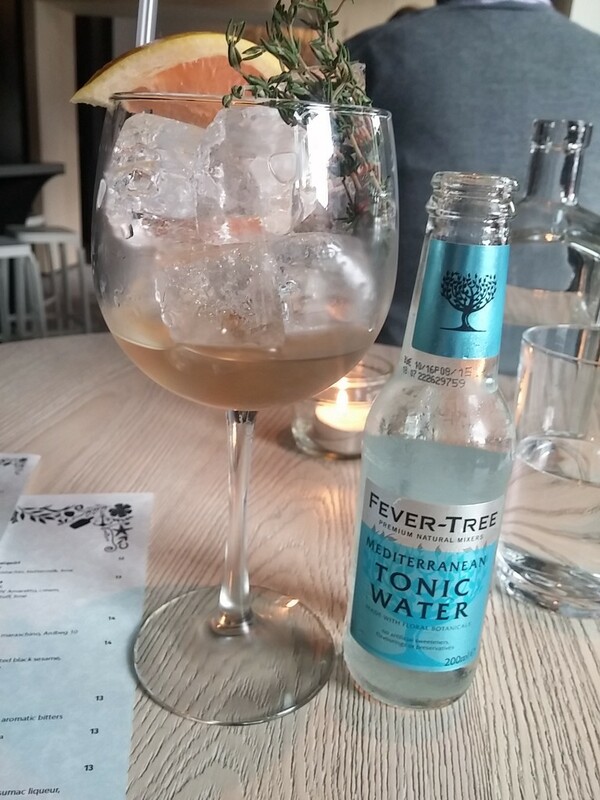 And not just a house version of the G & T at a hip bar, using an artisan tonic and a top-shelf gin (though those can be great, no doubt). 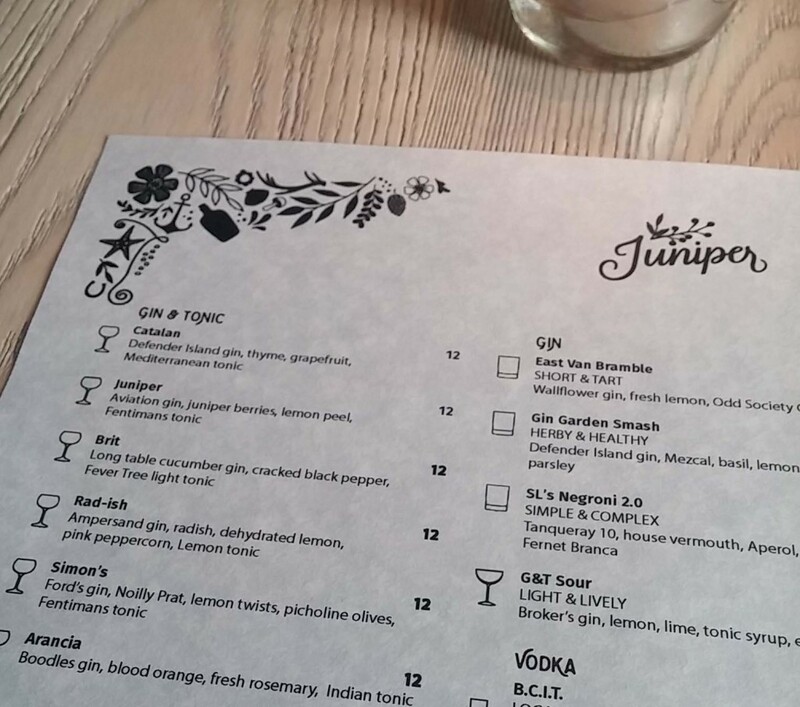 At Juniper up in Vancouver a couple months ago, I was presented with a drinks menu that had a gin and tonic section with six different options. Clearly the menu’s updated regularly, as those on the current menu are a bit different from what I saw in March. I started with the Catalan, featuring Defender Island gin (very interesting, with smoked rosemary, I procured a bottle to bring home with me), grapefruit and fresh thyme. Then I couldn’t help also trying Rad-ish with Ampersand gin, sliced radish, pink peppercorns, dehydrated lemon and lemon tonic. Both were refreshing and flavorful–and what I particularly loved: quite savory. Pepper and herbs and citrus, no compulsion to add some sweet (my #1 pet peeve in the cocktail department). A little over a year ago I was at Jaleo in Washington, DC–which was the first time I can remember seeing a menu featuring different gin and tonic combinations. It wasn’t until that recent visit to Juniper that I began to ponder why more places don’t offer a few or more G & T options to choose from. There are so many beautiful and wildly diverse gins available, an ever-increasing selection of tonics (or tonic syrups, or housemade tonics), a range of potential accent in gredients–citrus, herb, spice–that echo characteristics of the gin’s botanicals. It’s an open invitation to get creative. I’ll be keeping my eye out for more G & T menus popping up on drinks lists. (I’d love to hear about any you’ve seen, drop a comment below with any insights.) In the meantime, I’ll work to up my own G & T game over the coming months. I may even jump on that DIY tonic bandwagon as so many have (including David Lebovitz). I’ve already played around with custom gin-like infusions and was due to experiment a bit more with that. Imagine all the delicious potential of a G & T that’s hyper-customized! Without it being my intention when I started this post, I feel as thought I’ve just established my summer home-school program. I’ll be sure to keep you apprised of any particularly delectable outcomes. And let me know too if you hit upon a great G&T list out there, or a particularly outstanding twist on the beloved, iconic, timeless gin and tonic.